Another Nauman piece at PMA, which is exhibiting his audio shows “Days and Giorni” through April 4. Image via Art21. 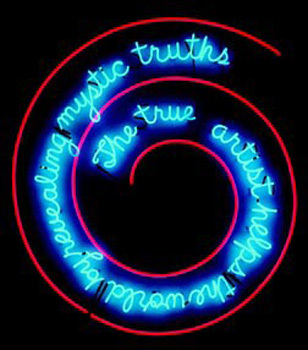 The Philadelphia Museum of Art, home to one of Bruce Nauman‘s earliest pieces, “The True Artist Helps the World by Revealing Mystic Truths” (1967), is showing two new audio series by this much beloved contemporary artist. With this new exhibition, he tampers with time: in both “Days” and “Giorni,” multiple voices recorded separately recite the days of the week. “Days” is in English; “Giorni” is in Italian, and was recorded in a single day. Both fill the echoing gallery spaces of PMA until the show’s close on April 4. An image of the artist, via ArtWeLove. Curated by Carlos Basualdo and Erica Battle, “Notations” plays each track — each time narrative — through a pair of speakers. The speakers are identical in make. Time is told and retold, notated and annotated, to be experienced through the community of voice and/or through the isolated speakings. Or, the hearer chooses which narrative(s) to hear, as presented by the artist. 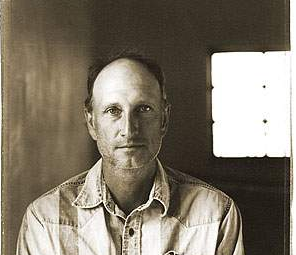 Born in Fort Wayne, Indiana, in 1941, Bruce Nauman gained his MFA from UC-Davis. He is the recipient of an NEA grant and a Wexner Prize, and has been a fellow at the American Academy of Arts and Sciences. His piece “Topological Gardens,” the United States’s official contribution to the 2009 Venice Biennale, won a Golden Lion. Solo shows include exhibitions at Tate Modern, London; Deutsche Guggenheim, Berlin; ICA New York; Centre Georges Pompidou, Paris; and MoMA. With just five weeks left in his toughest campaign as incumbent, Kohl told 18,000 party faithful at a Dortmund civic center that the election was a fight for the direction of Germany and painted his opponent as a showman hiding behind vague promises. “We can win. We want to win. We will win,” Kohl pledged. His conservative Christian Democrats lag in the polls, but many voters say they haven’t decided who they will choose in Sept. 27 parliamentary elections. Kohl’s measured tone and well-worn rhetoric Sunday contrasted with Social Democratic candidate Gerhard Schroeder’s impassioned speeches in three cities Saturday. Much of Kohl’s hour-long speech focused on his achievements in 16 years as chancellor, including German unification. But Kohl offered few specifics about what he would do in the next four years if reelected. He ruled out the possibility as “silly talk,” and warned Germans against electing an untested government. Kohl emphasized the importance of a stable Germany in the heart of Europe as financial crises rock Russia and Asia and tensions rise in the Balkans and Africa. Germany faces a political choice between “two fundamentally opposing directions” as it heads toward the new millennium, Kohl said, citing opinion polls showing his party is closing the gap with the Social Democrats. “We’re going to make it,” he proclaimed. Kohl charged his foes were running “a campaign of the forked tongue” that lacked clear ideas for the nation’s future and obscured sacrifices Germans would have to make to compete in the world economy. “The aim is to deceive voters,” he declared. But in a move some saw as desperate, Kohl also gave the floor to two critics in an effort to demonstrate openness to new ideas. Both were enlisted this year to try to rally votes in the east, where Kohl’s support has crumbled since unification because of the region’s economic problems. The chancellor said a shift to the political left would worsen the economic decline. Kohl said Germany’s record unemployment – the core campaign issue – would improve under his government. “That is why it’s important for us to stay on course,” he said. This entry was posted on Thursday, March 18th, 2010 at 2:18 pm	and is filed under Go See. You can follow any responses to this entry through the RSS 2.0 feed. You can leave a response, or trackback from your own site.